A hot spring is where warm or hot water issues from the ground and the source of the water is 25 degrees or more centigrade or it contains certain minerals. The health benefits vary depending on the minerals contained, but in general hot springs are said to relieve fatigue and facilitate recovery from illness and injury. Shampoo, body soap and hair dryers are provided. Before getting into the bath, please rinse your body off. When you wash your body, do so outside of the bath. Please do not put towels into the hot spring water. The bath is slippery, so please be careful. Kaiseki is a full-course Japanese-style dinner which combines fried foods, fish and meat with seasonal foods. Not only is the utmost care taken in the preparation of each item on the menu, but the layout and dishes are also carefully selected to create a work of culinary art that can be visually enjoyed as well. If there is a Japanese dish that you cannot eat, please notify us before the meal is prepared and we will substitute a different item. 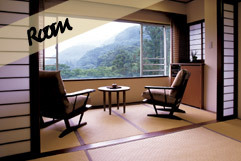 Our rooms are Japanese-style rooms. The floors are covered with tatami mats like you would find in a traditional Japanese home. Japanese-style rooms are characterized by alcoves and sliding doors. Please remove your slippers before walking on the tatami mats. Package A rooms have beds. Package B rooms do not have beds, but we will bring futon mats at the designated time. Please help yourself to the snacks and tea in your room. They are provided free of charge. Are there any other precautions? 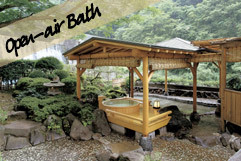 ・Please leave your key at the front desk when you go to the common bath or leave the hotel. ・The water from the tap is safe to drink.